In 1883, London was officially 28 years old. 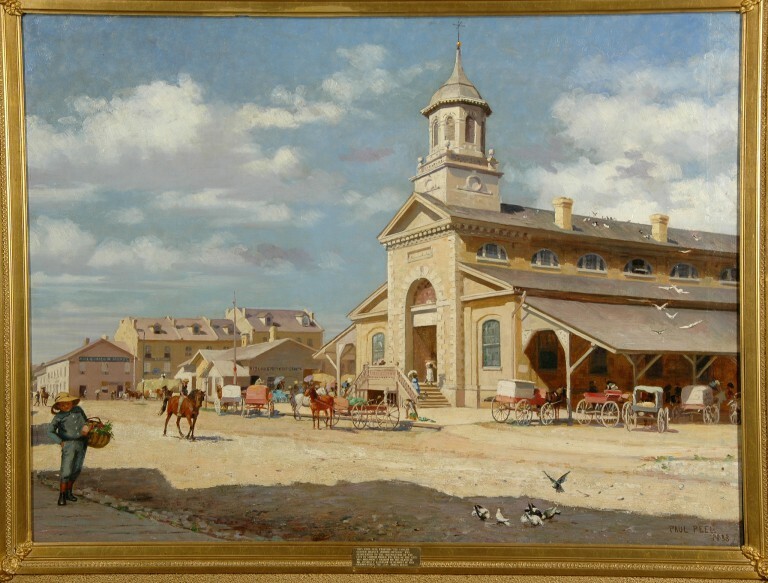 Convent Garden Market was nearing 50, having begun as an open-air market in 1835. After a permanent market building was erected, farmers sold their goods inside every Tuesday, Thursday, and Saturday. Outside, vendors of everything from toys to animals plied their wares. In Peel’s painting, the Market is hardly the bustling centre depicted in many photographs of the time. Rather than focus on the excited jumble of horses, carts and buggies that market days would bring, Peel highlights the building’s stately Georgian-inspired architecture. Indeed, the building had impressive credentials: it was designed by architect Samuel Peters (1822-1882), who also designed Grosvenor Lodge (1853) and oversaw the design and construction of London City Hall (1853-54). Peel spent the summer and fall of 1883 in London before returning to Paris. He exhibited at the Western Fair and Toronto Industrial Exhibition, where Florence Carlyle also exhibited several works. Peel encouraged Carlyle to seek art instruction abroad. Carlyle would take his advice, travelling with him and his sister Mildred to Paris in the fall of 1890. Carlyle’s surviving descriptions of that time illuminate the challenging experiences of local artists who, like Peel, sought inspiration and instruction outside Canada.